Do I need to have a PayPal account to complete my purchase? No. 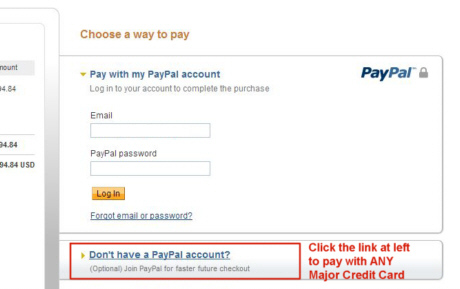 We use PayPal for our credit card processing, but you DO NOT need to have a PayPal account to complete your purchase. After you "proceed to payment" click on the option at bottom right that says "Don't have a PayPal account?" and you will be able to complete your purchase with any major credit card. See image below. You may use this option even if you DO have a PayPal account, but prefer to pay by credit card for this purchase. No we do not have a Showroom at our Corporate Office location in Miami, FL. Our planters ship from various locations across the US and most are not inventoried in Florida. Do you offer "wholesale" pricing to Designers and other re-sellers. Our pricing is already heavily discounted and most items also include FREE shipping so we do not offer wholesale pricing. What about "volume discounts" do you offer any? On orders of $5000.00 or greater, we may be able to offer additional discounts on certain items Please call us to discuss your order if it is $5000.00 or more. Can I plant directly into your planters, or should I leave my plants in the nursery container? Almost all of our planters can be directly planted, with the exception a few of the wooden ones. The product details of each planter clearly indicate suggested uses so we highly recommend that you read the product details before ordering. Also feel free to call us with any questions. We're always here to help. Can your fiberglass planters be left outside during the winter? Yes, our fiberglass planters may be left outside during the winter months. Can you fabricate custom planters for me if I have an idea that I would like to become a reality? Yes, we can custom fabricate steel, aluminum and fiberglass planters. Steel and aluminum do not require a minimum order and take about ten+ weeks to fabricate once you approve the design. There is a onetime $100.00 design fee which is applied to the cost of your planters if you proceed with the order. There is no design fee on re-orders of the same planter. Fiberglass planters require that a mold be fabricated and unless you are ordering a large number of planters (20 or more) the cost of the mold would be prohibitive. Call us with questions. I don't see the color I would like. can you do custom colors? Yes some of our planters can be custom colored. There is a onetime non-refundable "color match" fee of $200.00 per color. Once you approve a color match, the color is saved and it may be applied to future orders of planters in the same "family" with no additional fee. I see a planter offered in a size that I would like on the product detal page, but when I try to order it, the size desired does not show on the drop-down list. What's up with that? The product that you are ordering is temporarily out of stock in the size you desire, so it has been removed from availability. Please contact us if you would like us to notify you when it is available again. I only received a part of my order. Why did that happen? Depending upon what you ordered, we ship from different locations so you may receive some items before others. Some items are also custom painted and so they take a little longer to be processed before they ship. I ordered four different items and I received an email telling me that only two are in stock so my order was canceled and refunded. Why would that happen? We assume that you want all items ordered or none at all, so if any item in your order is out of stock, we try to contact you to determine if you still want the other items. If we do not receive a response from you within 72 hours, we automatically cancel the order and issue a refund. If you DO want the items on hand, please reorder only those items.